The InterVarsity Press New Testament Commentaries target pastors, teachers, students, Bible teachers, and small group leaders of all sorts with a combined appeal to heart and scholarship. Two observations stand out about the series in general. 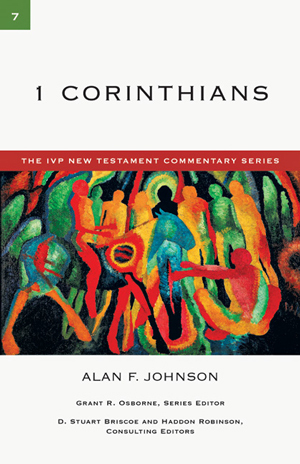 First, Johnson and the other authors have successfully been able to present biblical exegesis and discuss thorny interpretive issues in language that is engaging and accessible. Second, the authors who have been selected to write the commentaries on the books that play a major role in the egalitarian conversation are evangelical egalitarians. So much of the discussion surrounding the relationship of men and women in the church, home, and society is not an "easy read," so these presentations are welcome and effective additions to the conversation. Alan Johnson is emeritus professor of New Testament and Christian ethics at Wheaton College and Graduate School. His work on 1 Corinthians is particularly engaging. His reference notes and bibliography provide an entry into further study if desired, all while maintaining an appealing readable style. He deftly bridges the two horizons of the Greco-Roman culture and American culture. He skillfully selects and integrates patristic support and anecdotes from church history with his own story, observations, and critiques of our contemporary culture. Johnson's treatment of women in the home, church, and society is of special interest. He devotes a significant amount of space to the most relevant passages: 7:1-40, 11:2-16, and 14:34-35, and makes egalitarian observations, connections, and applications in other related passages. Johnson summarizes with fairness a selective range of the major interpretive views in these highly controversial passages, interacts with them, and then states his own position. Concerning Paul's discussion on marriage, divorce, remarriage, and singleness as a calling in 7:1-40, he observes that Paul's egalitarian emphasis in verse 5 "is nothing short of amazing" (110). Johnson's discussion on the dispute over head attire for men and women in worship in 11:2-16 begins with his personal journey, wherein he went from rejecting women's leadership in worship to affirming men and women leading in worship as equals. He concludes that women are to pray and prophesy in the church service and have authority over their heads, but reflect their sexual identity in their dress and outward appearance. However, he is especially critical of both subordinationist and egalitarian readings of the passage and claims, "We must acknowledge that there is some sort of patriarchal ordering in Paul's argument in verses 7-9," a tension which he fails to resolve or expand theologically or practically. The brief but widely discussed command for women to keep silent in the churches in 14:34-35 is constrained by the reference to women praying and prophesying in 11:2-16 and is placed in the context of the discussion on tongues, prophecy, and maintaining order in the church service in chapter 14. Johnson concludes that the issue is circumstantial in Corinth. The women wanted to learn, but they were not as well educated as the men, and their manner of interrogation in the church service was disruptive. Johnson also refers to the position and function of women in other verses and passages, making connections and drawing inferences. He includes patristic citation to show that the manifestations of tongues, as well as the other "spiritual gifts" in chapters 12-14, were gender inclusive. The unity of the baptism of the Holy Spirit is paralleled with Galatians 3:28 (neither Jew nor Greek, slave nor free, male nor female), which he sees as "not merely a unity of diversity of gifts, but...social and political in nature" (231). Most important is his discussion of 1 Corinthians 15:28, which often is used to support a functional hierarchy in the Trinity, with a subordination of Christ to the Father being used to justify subordination of women to men (cf. 11:3). His discussion is a clear and compelling rejection of subordinationalist Christology as "unbiblical and heretical" (295). Johnson shows that the command in 16:16 to submit to every worker and laborer in the ministry included submission to certain women (cf. Rom. 16:1-2). Finally, he offers a reconstruction of Paul that counters mythical views of him as a misogynist, based on Paul's relationship with Priscilla (16:19, cf. Rom. 16:3-4). The reader would be helped by continual reference to the book outline that is located in the introduction.